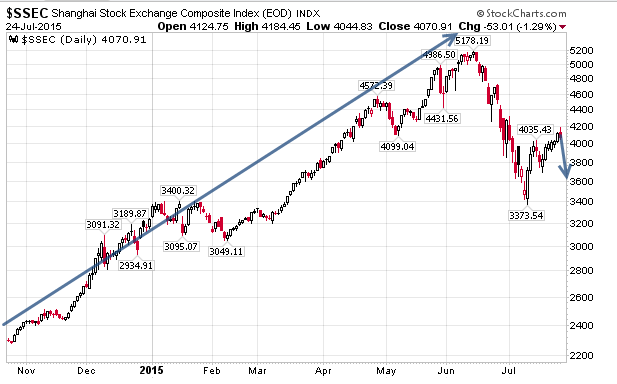 The crash in Chinese stocks continued today following a respite last week. Shares on the Shanghai index plunged 8.48%, the Biggest One-Day Plunge Since February 2007. The CSI300 index of the largest listed companies in Shanghai and Shenzhen fell 8.6 percent, to 3,818.73, while the Shanghai Composite Index SSEC lost 8.5 percent, to 3,725.56 points. The drops were the biggest since Feb. 27, 2007. It wasn't immediately clear what caused such a sharp tumble in the afternoon session. At midday, the two indexes were down about 2.5 percent. "The recent rebound had been swift and strong, so there's need for a technical correction," said Yang Hai, strategist at Kaiiyuan Securities. It should be immediately clear stocks are in a bubble, so there is no need to search for a "reason" for the plunge. If anything, one might wonder why the stocks rose to such absurd valuations in the first place. Stock rose from about 2300 in November to 5178 in June. That was an advance of 125% or so in about seven months. 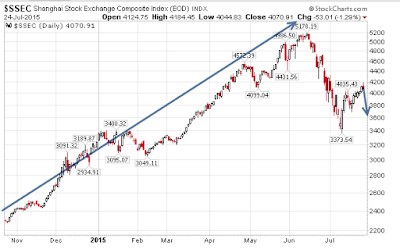 Today's decline is shown by the second blue arrow. Since the plunge in June, China stepped in to directly buy stocks, prohibit short selling, halted trading on half the companies, and prohibited large shareholders from selling any shares for six months. Expectation of such moral-hazard maneuvers coupled with cheap money is exactly what fuels bubble activity in the first place. Amusingly, margin buying is still at or near record levels.